WW II U.S. veterans who served in France are eligible this distinction upon presentation of their detailed military file. Those selected are appointed to the rank of Knight of the Legion of Honor. 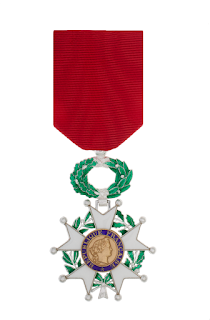 The Legion of Honor medal is not awarded posthumously. Pfc. Seiji Oshiro was born and raised on Oahu, Hawaii. Her served in World War II on an anti-tank gun crew with the 442nd Regimental Combat Team, the most decorated unit of its size in World War II. His campaigns include Southern France, Rome-Arno, Northern Apennines, Po Valley and the Rhineland. His significant decorations include the Bronze Star Medal, the Purple Heart Medal, the Combat Infantryman Badge, the EAME Campaign Medal with 1 silver star and arrowhead, the Asiatic-Pacific Campaign Medal, and various other campaign medals. He was awarded the Congressional Gold medal in a special ceremony at the US Capitol in November 2011. Seiji resides in Huntington Beach, CA. T/Sgt. Tokuji Yoshihashi was born in Pasadena, California in January 1923. During World War II he served with Company A of the 100th Battalion of the 442nd Regimental Combat Team. His significant military decorations include the Bronze Star Medal, the Combat Infantryman Badge and the EAME Campaign medal. His unit was presented the Congressional Gold Medal at a ceremony in Washington D.C. in November 2011. Tokuji resides in San Gabriel. S/Sgt. Harry H. Kanada was born in Honolulu, Hawaii in January 1918. D During World War II he served with Company K of the 100th Battalion of the 442nd Regimental Combat Team. His significant military decorations include the Bronze Star Medal, the Purple Heart Medal, the Combat Infantryman Badge and the EAME Campaign medal. His unit was presented the Congressional Gold Medal at a ceremony in Washington D.C. in November 2011. Harry resides in Los Angeles. S/Sgt. Hiroshi Nishikubo was born in Clarksburg, California in November 1921. During World War II he served with Company L of the 100th Battalion of the 442nd Regimental Combat Team. His significant military decorations include the Bronze Star Medal, the Purple Heart Medal, the Combat Infantryman Badge, the EAME Campaign medal and the Distinguished Unit Badge. His unit was presented the Congressional Gold Medal at a ceremony in Washington D.C. in November 2011. Hiroshi resides in Los Angeles. Sgt. Don S. Miyada was born in Oceanside, California in May 1925. During World War II he served with Company A of the 100th Battalion of the 442nd Regimental Combat Team. His significant military decorations include the Combat Infantryman Badge, the EAME Campaign medal and the Distinguished Unit Badge. His unit was presented the Congressional Gold Medal at a ceremony in Washington D.C. in November 2011. Don resides in Westminster, CA. Sgt. Fumio "Steve" Shimizu was born in Kona, Hawaii in April 1920. During World War II he served with Company F of the 442nd Regimental Combat Team. His significant military decorations include the Bronze Star Medal, the Purple Heart Medal, the Combat Infantryman Badge, the EAME Campaign medal and the Distinguished Unit Badge. His unit was presented the Congressional Gold Medal at a ceremony in Washington D.C. in November 2011. Steve resides in Laguna Woods. Sgt. Takashi "Frank" Sugihara was born in Los Angeles, California in January 1921. During World War II he served with Cannon Company of the 442nd Regimental Combat Team. His significant military decorations include the Bronze Star Medal, the Combat Infantryman Badge, the EAME Campaign medal, and the Distinguished Unit Badge. His unit was presented the Congressional Gold Medal at a ceremony in Washington D.C. in November 2011. Frank resides in Tustin. Sgt. Harry H. Yoshimura was born in Torrington, Wyoming in March 1922. During World War II he served with Company A of the 442nd Regimental Combat Team. His significant military decorations include the Bronze Star Medal, the Combat Infantryman Glider Badge, the EAME Campaign medal and the Distinguished Unit Badge. His unit was presented the Congressional Gold Medal at a ceremony in Washington D.C. in November 2011. Harry resides in Bellflower. Cpl. Noboru "Don" Seki was born in Honolulu, Hawaii in December 1923. During World War II he served with Company L of the 100th Battalion of the 442nd Regimental Combat Team. His significant military decorations include the Bronze Star Medal, the Combat Infantryman Badge, the EAME Campaign medal and the Distinguished Unit Badge. His unit was presented the Congressional Gold Medal at a ceremony in Washington D.C. in November 2011. Don resides in Long Beach. Pfc. George S. Kanatani was born in Redlands, California in May 1918. During World War II he served with Company A of the 442nd Regimental Combat Team. His significant military decorations include the Bronze Star Medal, the Purple Heart Medal, the Combat Infantryman Badge, the EAME Campaign medal and the Distinguished Unit Badge. His unit was presented the Congressional Gold Medal at a ceremony in Washington D.C. in November 2011. George resides in Redlands. Pfc. Makoto "James" Ogawa was born in Riverside, California in October 1923. During World War II he served with Company C of the 100th Battalion of the 442nd Regimental Combat Team. His significant military decorations include the Combat Infantryman Badge, the EAME Campaign medal, the Presidential Unit Citation and the Distinguished Unit Badge. His unit was presented the Congressional Gold Medal at a ceremony in Washington D.C. in November 2011. James resides in Gardena. Pfc. Takashi Wada was born in Sanger, California in February 1919. During World War II he served with Company L of the 442nd Regimental Combat Team. His significant military decorations include the Bronze Star Medal, the Purple Heart Medal, the Combat Infantryman Badge, the EAME Campaign medal and the Distinguished Unit Badge. His unit was presented the Congressional Gold Medal at a ceremony in Washington D.C. in November 2011. Takashi resides in Torrance. Sfc. Ted T. Wada was born in Redlands, California in February 1919 to Japanese immigrant parents. During World War II he served with the 442nd Regimental Combat Team K Company and was wounded in France and Italy. He later served in Japan with the 11th Airborne Division and in Korea with the 7th Army Division during the Korean War. His significant decorations include: the Bronze Star Medal, the Purple Heart Medal with Oak Leaf Cluster, the Combat Infantryman Badge, the Presidential Unit Citation, the EAME Campaign Medal, the Army of Occupation Medal-Japan, the United Nations Service Medal, the Korean Service Medal with 5 Bronze Stars, the Republic of Korea War Service Medal and various other campaign medals. In November 2011 he attended a special ceremony held at the U.S. Capital awarding his 442nd Regimental Combat Team unit the Congressional Gold Medal. Ted currently resides at the Veterans Home of California – Chula Vista. T.Sgt. Junwo “Jimmy” Yamashita was born in Santa Ana, California in May 1924 and later moved with his parents to Overton, Nevada. In May 1943 he joined the Japanese American 442nd Regimental Combat Team (RCT) and in May 1944 deployed to Europe as part of the largest Atlantic convoy ever assembled. He served as a Platoon Sergeant first in Italy and then in Southern France. His significant decorations include the Bronze Star Medal, the Purple Heart Medal, the Combat Infantryman Badge, the Presidential Unit Citation and the EAME Campaign Medal with 5 battle stars. In November 2011, the 442nd Regimental Combat Team was presented the Congressional Gold Medal at ceremonies in Washington D.C. After the war Jimmy went to technical trade school and for many years was in the appliance repair business, owning a number of stores. He was instrumental in the establishment of the Americans of Japanese Ancestry World War II Memorial and is Educational project officer for the Echoes of Silence program to keep alive the legacy of American World War II Nisei veterans. Jimmy resides in Glendora, California with his wife Marian. Pfc. Samiru Ikari was born in Tracy, California in August 1922. He was inducted into the U.S. Army in June 1943 and joined Company L of the 442nd Regimental Combat Team (RCT) in France in November 1944 during heavy fighting in the Vosges Mountains area. He later served in Italy. His significant decorations include the Bronze Star Medal, the Combat Infantryman Badge, two Presidential Unit Citations, and the EAME Campaign Medal with 3 battle stars. In November 2011 the 442nd Regimental Combat Team was presented the Congressional Gold Medal at ceremonies in Washington D.C. After the war Sam worked in the record manufacturing industry and later as a truck driver for Continental Airlines from where he retired. He resides in Rosemead, California. Pfc. Masayoshi Tsuida was born in San Pedro, California in October 1919. During World War II, he served in the U.S. Army, Company C, 100th Battalion, 442nd Regimental Combat Team (RCT). In October 1944, the 442nd RCT liberated the town of Biffontaine, France. In the town of Bruyeres, a monument was built by the townspeople in 1947 to honor the soldiers of the 100th Battalion, 442nd Regimental Combat Team who liberated their village, showed kindness and died in the Vosges forest. His significant decorations include the Bronze Star Medal, the Purple Heart Medal, the Combat Infantryman Badge, the Presidential Unit Citation, and the EAME Campaign Medal with 3 battle stars. In November 2011 the 442nd Regimental Combat Team was presented the Congressional Gold Medal at ceremonies in Washington D.C. After the war Masayoshi spent a long career in the commercial fishing business. He and his wife, Grace, reside in San Diego, California. S/Sgt. Seichi Sakaida was born in O’okala, Hawaii in July 1922. He served in Italy and France with Company K of the 442nd Regimental Combat Team. His significant decorations include the Purple Heart Medal, the Combat Infantryman Badge, the Presidential Unit Citation, the EAME Campaign Medal with 4 battle stars and the Asia-Pacific Campaign Medal. He resides with his daughter in Rancho Santa Margarita, California. S/Sgt. Frank M. Wada was born in Redlands, CA in July 1921. Frank served with the 442nd Regimental Combat Team, “E” Company, in Italy and France. His significant decorations include the Bronze Star Medal, the Purple Heart Medal, the Combat Infantryman Badge, the Presidential Unit Citation, and the EAME Campaign Medal with 4 oak leaf clusters. Frank resides in Spring Valley, California. T/Sgt. Masao Takahashi was born in Modesto, California in August 1924. He served with the 100th Infantry Battalion attached to the 442nd Regimental Combat Team. His significant decorations include the Bronze Star Medal, the Combat Infantryman Badge, the Presidential Unit Citation, the EAME Campaign Medal with three battle stars and the Army of Occupation Medal. In November 2011, the 442nd Regimental Combat Team was presented the Congressional Gold Medal at ceremonies in Washington D.C. Masao lives in Torrance, California with Elma, his wife of 68 years. Pfc. A. G. “Agie” Harada was born in Grant, Idaho in January 1924. He served with the 100th Battalion of the 442nd Regimental Combat Team. His significant decorations include the Bronze Star Medal, the Combat Infantryman Badge, the Presidential Unit Citation, the EAME Campaign Medal with three battle stars and the Army of Occupation Medal. In November 2011, the 442nd Regimental Combat Team was presented the Congressional Gold Medal at ceremonies in Washington D.C. Agie lives in Orange, California.